Introduction: Cancer of oral cavity is the uncontrolled expansion of damaged cell within the mouth cavity. 5-fluorouracil (5-FU) chemotherapy was focused to kill the cancer cell, but it would affect the surrounding normal cells during oral cancer treatment. This study included the evaluation of chemoprotective effects of curcumin (CU), as an herbal remedy, on 5-FU-induced-cytotoxicity toward oral cancer treatment, loaded within a nanocarrier system. CU was combined with 5-FU chemotherapy as a combinational drug-delivery system to evaluate synergistic effects. Materials and Methods: Nanoformulation of CU (nano-CU) and nanoformulation of 5-FU (nano-FU) were prepared by employing homogenization with high-energy sonication. The characterizations of prepared nanoformulations were evaluated on the basis of particle size, zeta potential, and polydispersity index (PDI) values. The chemopreventive effect of nano-CU on 5-FU induced-toxicity and synergistic efficacy were optimized through different in-vitro assays. Results: The average particle size of nano-CU and nano-FU were up to 200 nm, negatively-charged, and shown up to 4th-day control release of the drug within the acceptable concentration. IC50 value for growth inhibition was calculated as 47.89 and 26.19 μg/ml, respectively, for nano-CU and nano-FU. OCC was pretreated with nano-CU and shown the protective effect by reducing 5-FU induced-cytotoxicity by preventing normal cells through reduced viability. The DPPH-indicated fluorescence-tagged cells had quantified for antioxidant effect as it reduces intracellular reactive oxygen species level in OCC. Along with alteration in cell protein expression, Blc2, and Bax, shows enhanced apoptosis rate in OCC. Conclusion: Nano-CU provides chemoprotective nature towards 5-FU induced-toxicity, along with synergistic effects in oral cancer treatment. The chemotherapy of 5-FU was focused to kill the cancer cell, but it is also required to concentrate on the surrounded normal cell, which may also damage due to oral cancer treatment because of drug toxicity., There are two important aspects which may be produced better response efficiency of 5-FU chemotherapy. First, 5-FU should load in a nanocarrier system for specific delivery and thus an improvement in biological activity. Second, the 5-FU combined with curcumin (CU), a natural analog, which may provide protective effects during 5-FU chemotherapy along with synergistic efficacy against oral cancer treatment. CU is naturally occurring herbal species, with huge medicinal properties. CU extracted from Curcuma longa, generally known as “haldi.” CU has broad-spectrum therapeutic efficacy for several types of disease system and also shown the effective anticancer property., Cu also reported cellular protective efficiency against 5-FU-induced toxicity. CU has the strength to maintain the stable status of normal cells with its effective antioxidant, chemopreventive, and pro-apoptotic properties as adjuvant therapy. The earlier studies also confirmed that CU induces apoptosis in the malignant cell through antagonizing the transcription factors and Nuclear factor kappa B cellular pathways. CU has an antioxidant effect on reactive oxygen species (ROS) within damaged cells and maintains redox status of the cells by interfering with free radicals and lipid peroxidation. The main purpose of the study was to optimize CU adjuvant therapy and chemoprotective effects of CU into 5-FU-induced cytotoxicity in oral cancer treatment, both drugs loaded within a nanocarrier system. This study may also optimize the synergistic effect of CU with 5-FU chemotherapy as combinational drug delivery system to enhance apoptosis rate of malignant cells through alteration in protein expression within the cytosol and protective nature toward the normal cells. 5-FU was obtained from the Himedia chemical, India; CU, Sigma Aldrich Ltd, Bengaluru, India, and all the other chemicals and reagents used for experiments were analytical grade and supplied from Sigma Life-Sciences, India. The sonication technique was used with a higher level of energy application to collect fine particle size and to ensure the appropriate loading of the drug in nanoemulsion system. The two-phase Nan-E was prepared for CU and 5-FU drugs. First, the aqueous phase was processed by adding 5% v/v glycerol in deionized water and added soya phosphatidylcholine (0.5% w/v), with regular magnetic stirring for 15 min to prepare an aqueous phase. Separately, CU and 5-FU were dissolved in ethanol to form a drug solution, and soya oil (2%v/v) and tween 80 (5%v/v) were added gently in both drug solutions and vortexed for 20 min. The solvent was further vaporized and oil phase collected. After that, both phases, oil and water were allowed to heat (70°C–80°C) and the water phase was added constantly into oil phase with increasing homogenization (5 min at 6500 rpm) pursued, followed by higher energy ultrasonication at 20% amplitude for 12 min. All the experiments were repeated thrice and average nanoparticles size, surface charge, and polydispersity index (PDI) of nanoemulsions were recorded by Malvern Zetasizer (3000 HS, ver. 07.12, UK) at room temperature. The transmission electron microscopy (FEI, Netherlands), optimized the shape of nanoparticles, in diversified magnifications. The cumulative release of nanocarrier-loaded curcumin (nano-CU) and nanocarrier-loaded 5-FU (nano-FU) were monitored through dissolution method of drug Nan-E passed through dialysis bag. The desired quantity of nanoparticles sample was collected in dissolution medium, filled with saline (pH 4.5), at predetermined time duration up to a 4th day. The collected samples were undergone the quantification analysis through ultraviolet (UV) spectrophotometry analysis and comparatively examined through the plotted standard graph of pure drugs, (absorption vs. time) to draw release pattern of the CU and 5-FU. SCC090 (human-tongue squamous cell carcinoma), an oral cancer cells (OCC) were procured from National center for cell science, Pune. The cell was grown-up in Dulbecco's modified eagle culture medium, accommodated with glucose, sodium pyruvate, alanine with 10% fetal bovine serum-heat inactivated, and mixer of antibiotic. OCC was allowed to incubate, 10,000 cells/well (96 well plates), for 24 h. After 1 day, the culture media was supplemented with Nan-E samples in different concentration for 24 h and after that MMT was added in cell suspension for 4 h incubation and further washed thoroughly to monitor the colorimetric intensity of the cells in a plate reader at the absorption maxima 540 nm. 2,2-diphenyl-1-picrylhydrazyl (DPPH) indicator was incubated for colorimetric analysis to quantify the fluorescence intensity and obtain intracellular oxidization and sorting of ROS-affected cells and quantified high fluorescence intensity of incubated OCC treated with nano-FU. Flow cytometer recorded the fluorescence data, and these data were suggested that high level of oxidative stress within the OCC. This application was withdrawn through colorimetric indicator to scale-up ROS level in the cytoplasm. The intensity of cell uptake was recorded by flow cytometry at an excitation wavelength of 540 nm and discharge wavelength of 610 nm. The expressive concentration of proteins, Bax and Bcl2, which regulate apoptosis was quantified through Western blotting analysis of nano-CU and nano-FU-treated OCC. In short, the probing was done followed by extraction and separation. The sodium dodecyl sulfate polyacrylamide gel electrophoresis technique was used to blot the cellular mix and quantify the cellular protein expression. Blocking of desired protein was performed through primary antibody as locator followed by tagging of secondary antibody and enzyme, which enhanced the induction of product as coloring blots on the membrane paper and examine through Gel docs, Alpha Instruments, USA. All the experiments were performed three times and results were given as mean and SD (standard deviation). The significant difference between in-vitro studies were validated by student's t-test by GraphPad Prism, (7825, Fay Avenue, Suite 230, La Jalla, CA 92037, USA) statistical software (P > 0.05). The prepared formulation of nano-CU and nano-FU were characterized, on the basis of particle size, surface charge, and PDI. The average particle size ranges from 175 to 195 nm with negative surface charge, from −25 to −31 mV, due to the presence of tween 80, which minimized the interfacial tension between oil phase and aqueous phase. This phenomenon may influence the uniform distribution of oil droplet holding drug molecules into the other solution and maintaining the concentration throughout the Nan-E formulation. The average PDI of the nano-CU and nano-FU were lies from 0.35 to 0.63. All the characterizations were performed in triplet and compile in [Table 1], as average mean data. TEM image of nano-CU and nano-FU confirmed the uniform distribution of globules within the liquid system in spherical shape [Figure 1]. The cumulative release of nano-CU and nano-FU formulation was performed to optimize the time-concentration drug release pattern by dialysis tube method (pH 7.4). The drug sample passed through tagged dialysis tube into a saline-filled beaker and collected at the predetermined time interval. The release of drug concentration was quantified using UV spectrophotometer at 430 nm for CU and 265 nm for 5-FU and standardized through plotted calibration graphs. 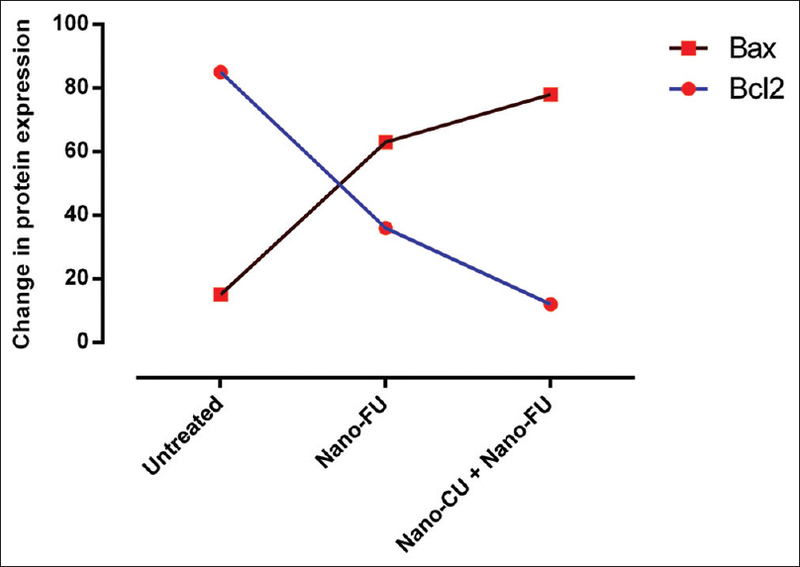 Nano-CU and nano-FU have shown control release pattern which increases with time and monitored up to 4 days. The in-vitro release of nano-CU has shown rapid release in the first 4h, and after that period control release was monitored up to 60h. The maximum quantity of drug was released between that time periods, 4 to 60h. After 60h, the drug has undergone steady state condition and slow release of the drug was optimized, only 18.65% drugs released from 60 to 90h. The nano-FU, have shown slow release up to 32 h, only 21% drug was released from the Nan-E formulation. The maximum release of nano-FU was shown at the time between 35 and 65 h about 67% drug released. The release patterns were comparatively shown in [Figure 2]. 3-(4,5-dimethylthiazol-2-yl)-2,5-diphenyl tetrazolium bromide assay was used to monitor the cell viability rate in SCC090 within a different concentration of nanoformulations (10 to 100μg/ml). 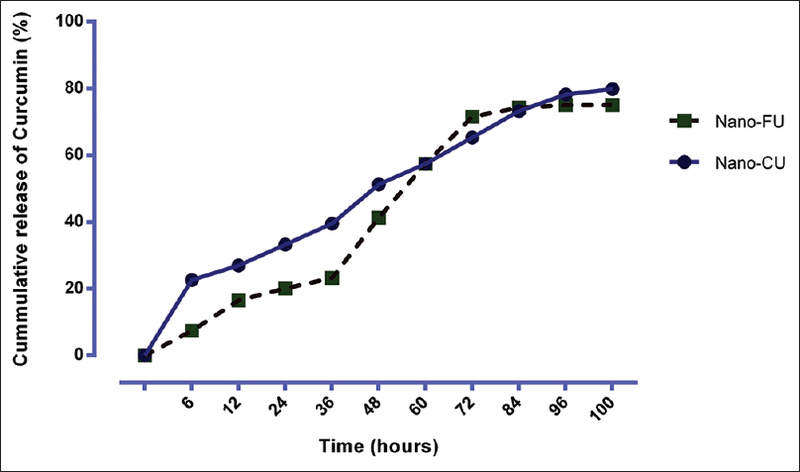 SCC090 were incubated with nanoformulations for 24h and inhibition rate was optimized and compared with negative control cells, which was treated with placebo agent [Figure 3]. The IC50 value of nano-CU was calculated about 47.89 μg/ml. The percentages of the viability of a cell in control group, compared with a significant difference to treated cells. The inhibition concentration of nano-CU may be useful to quantify the chemoprotective efficacy of 5-FU-induced cellular toxicity. The chemoprotective effect of nano-CU was established in OCC, against 5-FU-produced cellular toxicity to protect the normal cell. First, OCC was incubated with nano-FU formulation for 24 h to establish the cytotoxicity data of 5-FU in different concentration. 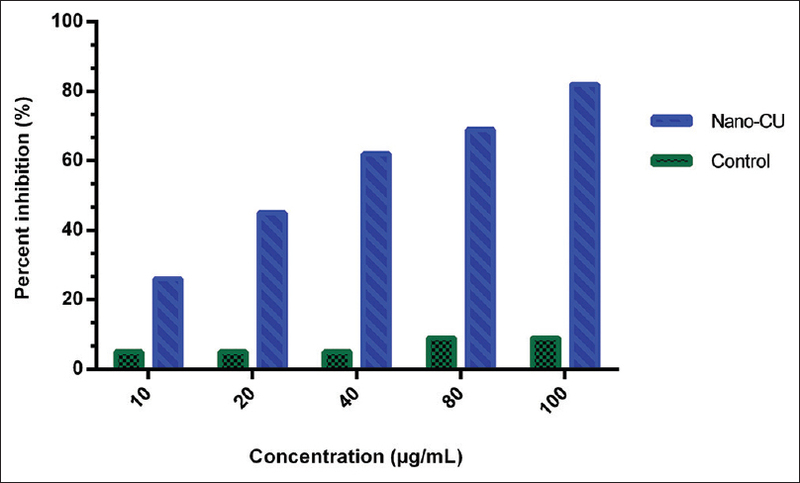 The cytotoxicity profile has shown the time-dependent concentration of the 5-FU, as the time increased with dose concentration directly enhanced the death rate of the OCC and increased the growth inhibition bout 78% at 80 μg/ml. The IC50 value of nano-FU was determined to be 26.19 μg/ml. The nano-FU has shown sufficient anticancer effect against OCC, confirmed the improved treatment within the nanocarrier system. 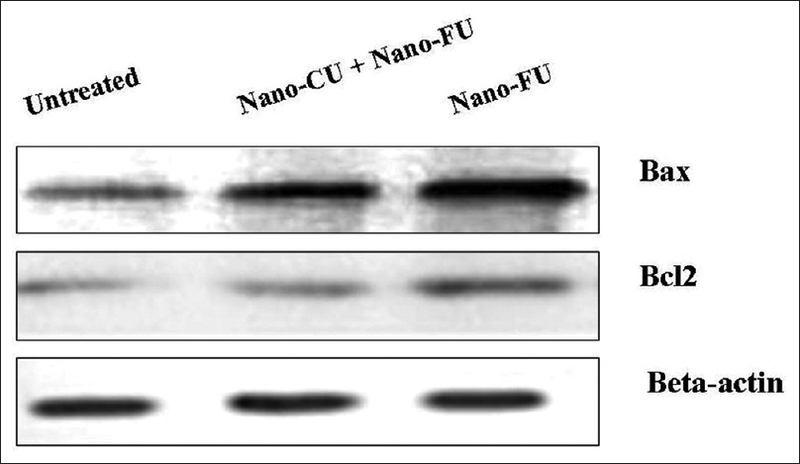 However, these 5-FU incubated OCC were repeatedly treated with 47.89 μg/ml of nano-CU, again for 24 h to examine the protection rate by CU in 5-FU-induced cytotoxicity and suggested about 7–9-fold protection by nano-CU against 5-FU-induced toxicity. This phenomenon revealed that the dose-dependent prolong treatment of 5-FU as chemotherapy of oral cancer, which may produce toxicity and this toxicity condition in normal cells may be overcome by adjuvant treatment with CU. It may produce cellular protection during chemotherapy, through reducing 5-FU-induced cytotoxicity by preventing normal cells through reduced viability and allow 5-FU for prolongation of treatment with increased dose, ultimately enhanced the chemotherapeutic effectiveness of 5-FU. The OCC was pretreated with 47.89 μg/ml of nano-CU for 12 h and then incubated with 26.19 μg/ml nano-FU, and comparatively, un-treated OCC was also incubated with nano-FU for 24 h to quantify the intracellular ROS level through fluorescence tagging by flow cytometry. The DPPH fluorescence was intracellular oxidized and sorted the ROS effected cells and quantified high fluorescence intensity after the incubation with nano-FU, these data suggested the oxidative stress in OCC [Figure 4]. In another hand, combined treated OCC (nano-CU pretreated and posttreated with nano-FU), significantly shown low fluorescence intensity. These results have suggested that low level of intracellular ROS in OCC was ultimately shown the protective mechanism of CU against oxidative stress during chemotherapy. 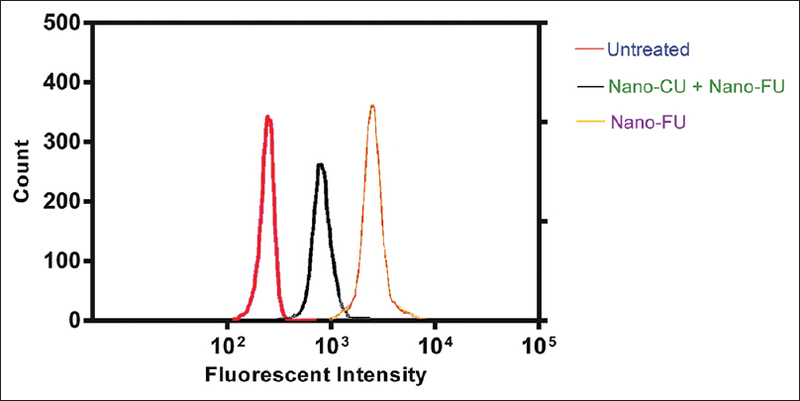 The DPPH indicator had shown the tagged fluorescence intensity as ROS level recorded by flow cytometer in OCC [Figure 5]. The protein expressions within the cytosol coordinate the apoptosis as Bcl2 protein shown anti-apoptosis response and resulting increased tumor mass. Untreated OCC has shown a high level of Bcl2 protein expression and low level of Bax, as a pro-apoptosis protein expressed. OCC was primarily treated with nano-CU (47.89 μg/ml) and suggested down-regulation of Bcl2 protein expression about 2 fold and up-regulation, about 1.5 fold of Bax protein expression [Figure 6]. The nano-CU treated and nontreated OCC was retreated with nano-FU, to optimize the changes in expression of Bcl2/Bax. First, the untreated OCC has shown about 3-fold decreased the level of Bcl2 expression and comparatively increased Bax expression. Second, nano-CU treated OCC were re-treated with nano-FU and the expression of Bcl2 protein suggested down-regulation, almost negligible. The Bax protein has shown about 4.5 fold up-regulation in expression by Western blotting analysis [Figure 7]. This expression of protein suggested that synergistic effect of CU and 5-FU in the nanocarrier system may enhance the apoptosis in malignant cells and regulate the death rate of the cancer cells. Oral cancer is the very common type of solid tumor, which affects global populations and specifically in a South Asian countries, including India. There were 3.7 million fresh cases of oral cancer was reported in India only in the year 2014 and the death rate may be expected to high 45% up to the year 2030. The tobacco habits and drinking alcohol is the prime elements to exhibit oral cancer. The chemotherapy along with surgical removal of tumor and radiation application is the essential treatment for oral cancer. The chemotherapy in the nanocarrier system may provide specific treatment over OSS. 5-FU chemotherapeutics drug have shown the desired response to produce antiproliferative action against OCC. Along with chemotherapeutic treatment, 5-FU may also induced-toxicity within the normal cells. Different studies about of 5-FU were reported longer duration of treatment, thus increased high level of dose-dependent toxicity. The natural analogs, CU, reported earlier with potential chemoprotective nature and antioxidant effects along with anticancer efficacy. The study included the nanoformulation of nano-CU, which was used combined chemotherapy with nano-FU toward OCC. 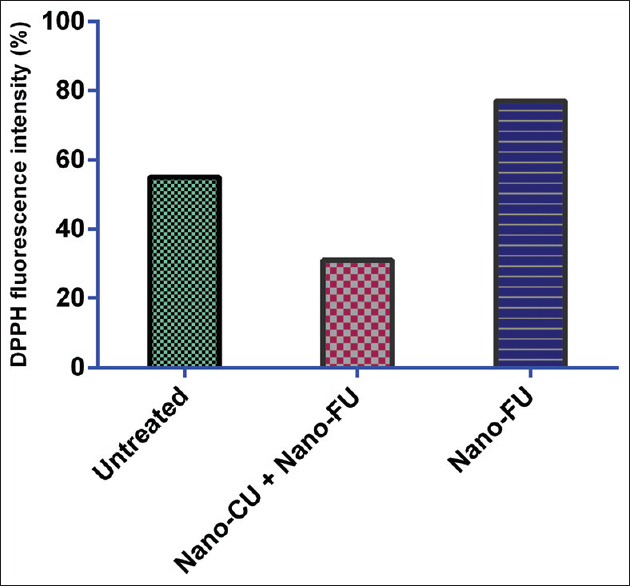 The in vitro assays suggested that CU has the capability to provide protective effect and may also enhance the synergistic efficacy of nano-FU chemotherapy. The leading uncertainty of nano-FU drug therapy against oral cancer was usually serious cytotoxicity toward healthy cells and disturbs the cellular pathways indirectly. The chemoprotective nature of CU may be beneficial to overcome this cellular disturbance and also synergistic efficacy for OCC. The prolonged use of 5-FU was earlier reported as high toxicity and dysfunction of regular redox status of the cells caused oxidative stress. The primary incubation of OCC with nano-CU was shown maintained viability and increased of cytotoxicity window (≤100%) of 5-FU, which ultimately help to prolong the chemotherapy. 5-FU-treated OCC was shown the higher intensity of ROS, and on the other hand, CU pretreated OCC has shown improvement in cellular pathways through regulating the secretion of free radicals and peroxide that damage the regular redox condition of the cells to maintain the normal condition of the human body. The improvement suggested that the CU have the ability to reduce the ROS level when it coadministered with 5-FU and shown an antioxidant mechanism to protect the oxidative stress in normal cells. These results have suggested that low level of intracellular ROS in OCC was ultimately shown the protective mechanism of CU against oxidative stress during chemotherapy. The idea behind to acknowledge CU additional benefits along with chemotherapeutic efficacy since in combinational drug delivery CU may provide supportive chemoprotective action with 5-FU and loaded with the nanocarrier system provides an upgraded platform to overcome the drawback of both the drugs such as low bioavailability, reduced half-life, and limited therapeutic efficacy. The cancer cells have altered the upregulation and subsequently downregulation of several protein expressions and inhibit the apoptosis of the tumor cells. The medicinal properties of CU have the potency to regulate the expression of a different protein which ultimately influences the apoptosis. The blotting analyses of protein expression for Bcl2 and Bax have shown similar observation data after the incubation with CU and 5-FU as a synergistic therapeutic effect. 5-FU treatment may be influenced the ROS upregulation and promote apoptosis rate, which may also affect the redox status of the normal cell, CU was highly affected and upregulate the apoptosis rate and also repair oxidant effect during 5-FU-induced toxicity within normal cells. The result observation has reflected the chemoprotective nature of CU along with combination chemotherapeutic effect with 5-FU, with in vitro cellular study in OCC. The nanoformulation has successfully uploaded the drug within nanocarrier chamber inhibit the drawback of the dosage form and influence the specific delivery of CU and 5-FU. The in-vitro release pattern suggested the sustained release of drugs up to 4th day and about 80% of loaded drugs were released. The resultant synergetic effect of nano-CU and nano-FU were significantly conducting the apoptosis. The data concluded that cotreatment of CU with 5-FU chemotherapy against oral cancer by damaging intracellular pathways in OCC. The combinational treatment of CU with 5-FU within the nanocarrier drug system may enhance drug bioavailability and half-life and shown a protective effect of CU over oral cancer treatment. The nano-CU may have the ability to synergistically maintained the cell viability with the reduced toxicity of 5-FU. Nano-CU was also inhibiting oxidant, ROS within the intracellular system induced by 5-FU longer treatment specifically over healthy cells as antioxidant effect and encouraged the longer period chemotherapy of oral cancer patients. The alterations in proteins expression (Bcl2 and Bax) have clearly demonstrated that codelivery of nano-CU and nano-FU, promoted the apoptosis rate in OCC. The overall observation suggested that CU have chemoprotective nature against 5-FU-induced toxicity due to several factors such as longer duration of chemotherapy of 5-FU and nonspecific action over healthy cells. These defects may repair by the use of CU as combinational drug delivery system against oral cancer. This research study is the part of Ph.D. work of the author, Saurabh Srivastava, and the author was thankful to Indian council of medical research, New Delhi, India, for providing financial support to carry out the research. Indian Council of Medical Research (ICMR), New Delhi, India (Project id-45/21/2013-NAN-BMS). Parizi KB, Akin D, Wong HP. Internalization of subcellular-scale microfabricated chips by healthy and cancer cells. PLoS One 2018;13:e0194712. Hussain SR, Ahmad MK, Mahdi AA, Naqvi H, Ahmad MW, Srivastava S, et al. Association of interleukin-10 (A1082G) gene polymorphism with oral squamous cell carcinoma in North Indian population. J Genet 2016;95:249-55. Rivera C. Essentials of oral cancer. Int J Clin Exp Pathol 2015;8:11884-94. Takiar R, Nadayil D, Nandakumar A. Projections of number of cancer cases in India (2010-2020) by cancer groups. Asian Pac J Cancer Prev 2010;11:1045-9. Coelho KR. Challenges of the oral cancer burden in India. J Cancer Epidemiol 2012;2012:701932. Gupta S, Gupta OP, Srivastava S. Role of CYP2E1 genetic polymorphism in the development of oral leukoplakia among tobacco users in North Indian population. Indian J Cancer 2014;51:154-8. Bundela S, Sharma A, Bisen PS. Potential compounds for oral cancer treatment: Resveratrol, nimbolide, lovastatin, bortezomib, vorinostat, berberine, pterostilbene, deguelin, andrographolide, and colchicine. PLoS One 2015;10:e0141719. Nazim UM, Rasheduzzaman M, Lee YJ, Seol DW, Park SY. Enhancement of TRAIL-induced apoptosis by 5-fluorouracil requires activating bax and p53 pathways in TRAIL-resistant lung cancers. Oncotarget 2017;8:18095-105. Pangeni R, Choi SW, Jeon OC, Byun Y, Park JW. Multiple nanoemulsion system for an oral combinational delivery of oxaliplatin and 5-fluorouracil: Preparation and in vivo evaluation. Int J Nanomedicine 2016;11:6379-99. Li LS, Morales JC, Veigl M, Sedwick D, Greer S, Meyers M, et al. DNA mismatch repair (MMR)-dependent 5-fluorouracil cytotoxicity and the potential for new therapeutic targets. Br J Pharmacol 2009;158:679-92. Polk A, Vistisen K, Vaage-Nilsen M, Nielsen DL. A systematic review of the pathophysiology of 5-fluorouracil-induced cardiotoxicity. BMC Pharmacol Toxicol 2014;15:47. Ma YS, Yang IP, Tsai HL, Huang CW, Juo SH, Wang JY, et al. High glucose modulates antiproliferative effect and cytotoxicity of 5-fluorouracil in human colon cancer cells. DNA Cell Biol 2014;33:64-72. Sumathi CS, Rajesh P, Kannan VR. The biological potentialsof indian traditional medicine, curcumin for treating human diseases. Cardiovasc Hematol Agents Med Chem 2017;15:91-103. Vyas A, Dandawate P, Padhye S, Ahmad A, Sarkar F. Perspectives on new synthetic curcumin analogs and their potential anticancer properties. Curr Pharm Des 2013;19:2047-69. Wang K, Zhang C, Bao J, Jia X, Liang Y, Wang X, et al. Synergistic chemopreventive effects of curcumin and berberine on human breast cancer cells through induction of apoptosis and autophagic cell death. Sci Rep 2016;6:26064. Rahmani AH, Al Zohairy MA, Aly SM, Khan MA. Curcumin: A potential candidate in prevention of cancer via modulation of molecular pathways. Biomed Res Int 2014;2014:761608. Wang L, Chen X, Du Z, Li G, Chen M, Chen X, et al. Curcumin suppresses gastric tumor cell growth via ROS-mediated DNA polymerase γ depletion disrupting cellular bioenergetics. J Exp Clin Cancer Res 2017;36:47. Rigon RB, Oyafuso MH, Fujimura AT, Gonçalez ML, do Prado AH, Gremião MP, et al. Nanotechnology-based drug delivery systems for melanoma antitumoral therapy: A Review. Biomed Res Int 2015;2015:841817. Ganta S, Talekar M, Singh A, Coleman TP, Amiji MM. Nanoemulsions in translational research-opportunities and challenges in targeted cancer therapy. AAPS PharmSciTech 2014;15:694-708. Irimie AI, Sonea L, Jurj A, Mehterov N, Zimta AA, Budisan L, et al. Future trends and emerging issues for nanodelivery systems in oral and oropharyngeal cancer. Int J Nanomedicine 2017;12:4593-606.
de Oliveira CP, Büttenbender SL, Prado WA, Beckenkamp A, Asbahr AC, Buffon A, et al. Enhanced and selective antiproliferative activity of methotrexate-functionalized-nanocapsules to human breast cancer cells (MCF-7). Nanomaterials (Basel) 2018;8. pii: E24. Gera M, Sharma N, Ghosh M, Huynh DL, Lee SJ, Min T, et al. Nanoformulations of curcumin: An emerging paradigm for improved remedial application. Oncotarget 2017;8:66680-98. Naseri MH, Mahdavi M, Davoodi J, Tackallou SH, Goudarzvand M, Neishabouri SH, et al. Up regulation of bax and down regulation of Bcl2 during 3-NC mediated apoptosis in human cancer cells. Cancer Cell Int 2015;15:55. Petersen PE. Oral cancer prevention and control – The approach of the World Health Organization. Oral Oncol 2009;45:454-60. Niaz K, Maqbool F, Khan F, Bahadar H, Ismail Hassan F, Abdollahi M, et al. Smokeless tobacco (paan and gutkha) consumption, prevalence, and contribution to oral cancer. Epidemiol Health 2017;39:e2017009. Tapia JL, Goldberg LJ. The challenges of defining oral cancer: Analysis of an ontological approach. Head Neck Pathol 2011;5:376-84. Tawfik E, Ahamed M, Almalik A, Alfaqeeh M, Alshamsan A. Prolonged exposure of colon cancer cells to 5-fluorouracil nanoparticles improves its anticancer activity. Saudi Pharm J 2017;25:206-13. Walker EA, Foley JJ, Clark-Vetri R, Raffa RB. Effects of repeated administration of chemotherapeutic agents tamoxifen, methotrexate, and 5-fluorouracil on the acquisition and retention of a learned response in mice. Psychopharmacology (Berl) 2011;217:539-48. Sahin K, Orhan C, Tuzcu M, Sahin N, Tastan H, Özercan İH, et al. Chemopreventive and antitumor efficacy of curcumin in a spontaneously developing hen ovarian cancer model. Cancer Prev Res (Phila) 2018;11:59-67. Geng R, Chen Z, Zhao X, Qiu L, Liu X, Liu R, et al. Oxidative stress-related genetic polymorphisms are associated with the prognosis of metastatic gastric cancer patients treated with epirubicin, oxaliplatin and 5-fluorouracil combination chemotherapy. PLoS One 2014;9:e116027. Hung JH, Teng YN, Wang LH, Su IJ, Wang CC, Huang W, et al. Induction of Bcl-2 expression by hepatitis B virus pre-S2 mutant large surface protein resistance to 5-fluorouracil treatment in Huh-7 cells. PLoS One 2011;6:e28977. Syng-Ai C, Kumari AL, Khar A. Effect of curcumin on normal and tumor cells: Role of glutathione and Bcl-2. Mol Cancer Ther 2004;3:1101-8.